Black Paella or Black Rice is a Mediterranean dish characterized by its striking black color. 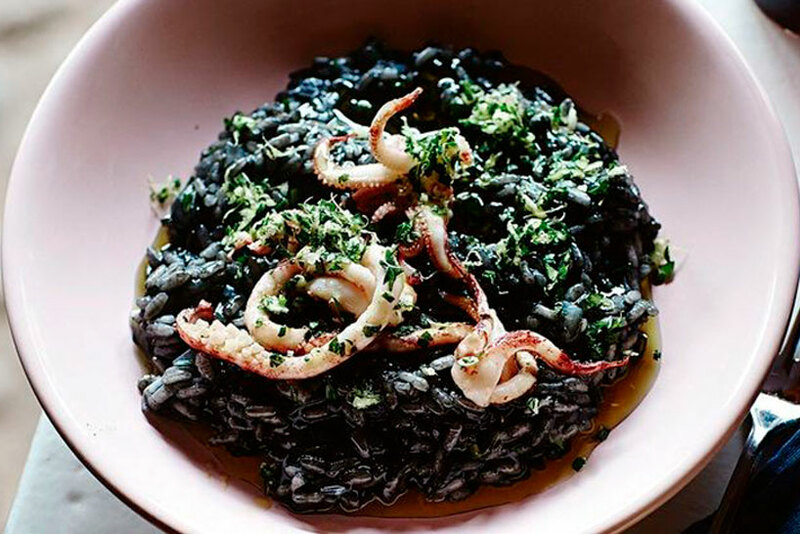 This black color comes from the squid ink, which is included in this recipe. The ink can be bought separately, but usually is included with the cuttlefish or squid. For other recipes or for the chicken paella recipe click the link! Ask your fishmonger to clean both the squid and the cuttlefish well, and to keep the ink for you, as you need it for this black paella. At home, chop them into rings and reserve them. To start, prepare a frying pan with 2 spoonfuls of oil and put it on medium heat. Fry the chopped garlic and add some bay leaves. When the garlic begins to take on color, remove the bay leaf and break it. Then reduce the temperature and add the cuttlefish and squid with the ink to cook them. Add the laurel too. Next, stir for a few minutes until they have an opaque color. Then turn off the fire and set it aside. On the other hand, heat the remaining 2 spoonfuls of oil in a paella pan and add the chopped onion. Stir until it is translucent. When it is tender, add the rice and stir constantly while frying for 1 minute. Next, pour in the white wine and let it evaporate, this will take approximately a couple of minutes. Pour a little more than half of the broth and let it cook for 10 minutes over high heat. Then add the remaining broth, the whole prawns on top, the cuttlefish and the squid with the ink, salt it and stir so that the ink is distributed evenly. Let it cook for another 8 minutes until the rice has cooked completely (according to the package instructions) and the prawns are cooked. Before serving, let it rest away from the heat for 3 minutes and sprinkle the parsley on top. This dish is usually served with aioli and lemon wedges. Have you ever tried squid´s ink? Give this recipe a go! If you like Seafood, this Black Paella will be your favorite!